Caveat Emptor = Buyer Beware = Watch Out! - В сложной финансовой ситуации приходит на помощь кредит наличными в Казахстане. Caveat Emptor. Buyer Beware!!!! This is a doctrine that applies to commercial property transactions. 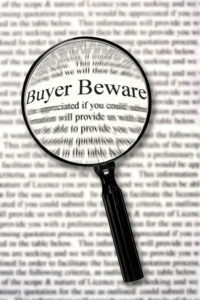 Watch out and do your due diligence when entering into a commercial real estate transaction. If you do not, the doctrine of caveat emptor will apply which puts the onus on you, the buyer, to discover material facts relating to the property. In Transcapital Bank v. Shadowbrook at Vero, LLC, 42 Fla.L.Weekly D1657b (Fla. 4th DCA 2017), a bulk buyer purchased 123 out of 164 condominium units for approximately $11 Million. The buyer, thereafter, sued the seller / lender for fraud, among other counts, claiming it was misled about the value of the property and, particularly, each of the condominium units. Post-trial, the seller / lender appealed claiming the trial court erred in denying its motion for directed verdict at trial. The appellate court agreed that the trial court erred. Why? The doctrine of caveat emptor applied to this commercial transaction where the buyer purchased 123 condominium units. “This doctrine places the duty to examine and judge the value and condition of the [commercial] property solely on the buyer and protects the seller from liability for any defects.” Transcapital Bank, supra, quoting Turnberry Court Corp. v. Bellini, 962 So.2d 1006, 1007 (Fla. 3d DCA 2007). There are three exceptions to the applicability of caveat emptor: 1) where the buyer has been prevented from making an independent inquiry regarding the property due to a trick from the buyer; 2) where the buyer does not have equal opportunity to become apprised of a material fact; and 3) where the seller discloses some facts but not the whole truth regarding those facts. Transcapital Bank, supra citing Turnberry Court Corp. v. Bellini, 962 So.2d 1006, 1007 (Fla. 3d DCA 2007). None of the exceptions, however, applied to this transaction. “Even if any of the defendants [seller / lender] had misrepresented the property’s appraised value, such a misrepresentation would not be actionable under the doctrine of caveat emptor in the absence of evidence that the defendants resorted ‘to some fraudulent means in preventing a prospective purchaser from making an examination of the property under consideration.’” Transcapital Bank, supra, citing Farnham v. Blount, 11 So.2d 785, 790 (Fla. 1942).